Everyone can become a Volunteer (Free) - Generate Donations, a TEAM and Passive Income! Volunteers can access Organizations or High-Powered individuals to increase aggressively Volunteers in your TEAM. 65 million Volunteers already help causes, they need new fundraising ideas and CausesFunding.TEAM is a unique way to generate lifelong donations for Charities and a massive reach of Volunteers. Everybody Wins! Double Contributions to your Cause. 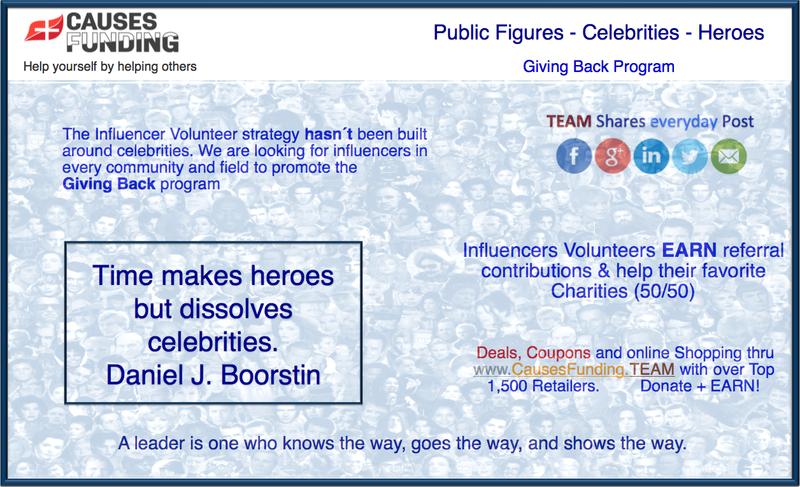 CausesFunding.TEAM encourages & facilitates charitable giving by pro athletes and celebrities, creating a TEAM by recruiting new volunteers is the best way to give back to the community with an exponential effect! Great career progression, opportunity to learn, collaborative culture, to create smart TEAMs. 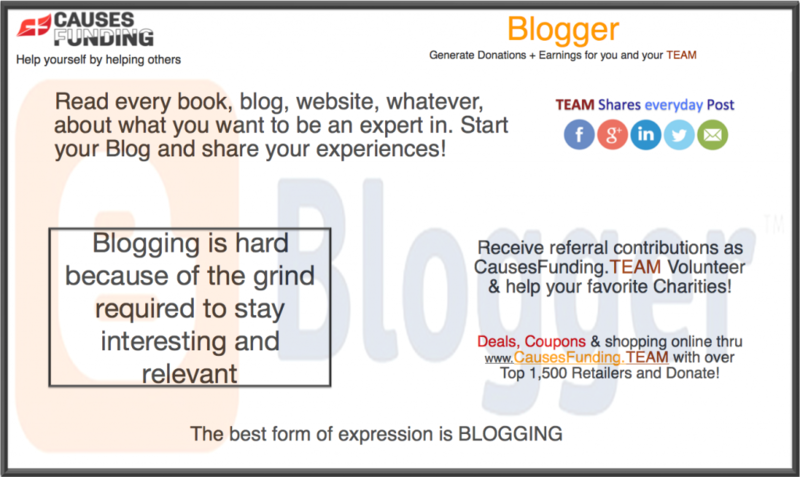 A blog is a frequently updated personal journal on a website. It is a place to express yourself to the world. Some very successful! The idea is to invite Top Bloggers to become CausesFunding.TEAM volunteers, help with donations and start a TEAM with the economic rewards. Universities, Alumni Associations & Fraternities need funding, resources become tighter. CausesFunding.TEAM is a new revenue generation source for them to develop their programs and help their members (volunteers) financially. Organizations can Double their Contributions! Invite them as an Alumni or a Fundraiser! 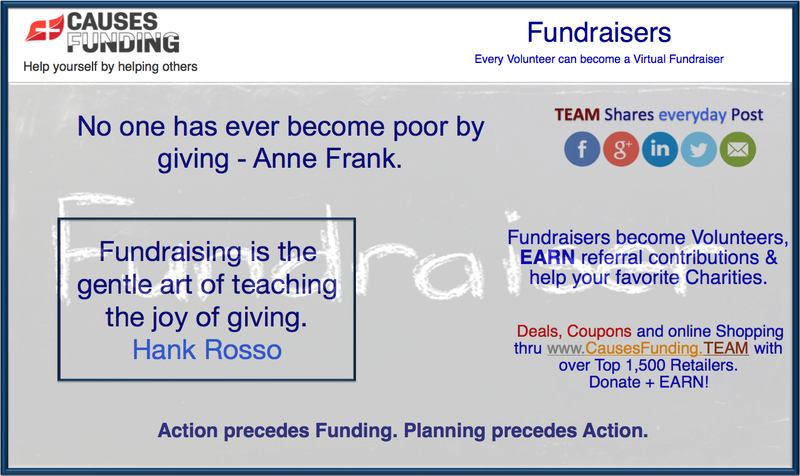 In CausesFunding.TEAM every Volunteer becomes a Fundraiser with his TEAM. Professional Fundraisers have access to Charities and they already work with 62 million Volunteers. All of them have the potential to become CausesFunding.TEAM Volunteers where they Help + Earn referral contributions from their TEAM online shopping. There is all kind of Clubs, formal or informal groups of individuals to cultivate their interests. These organizations require funds to seek their goals. CausesFunding.TEAM generates Double Contributions to organizations. Volunteers create a TEAM and improve their financial situation. 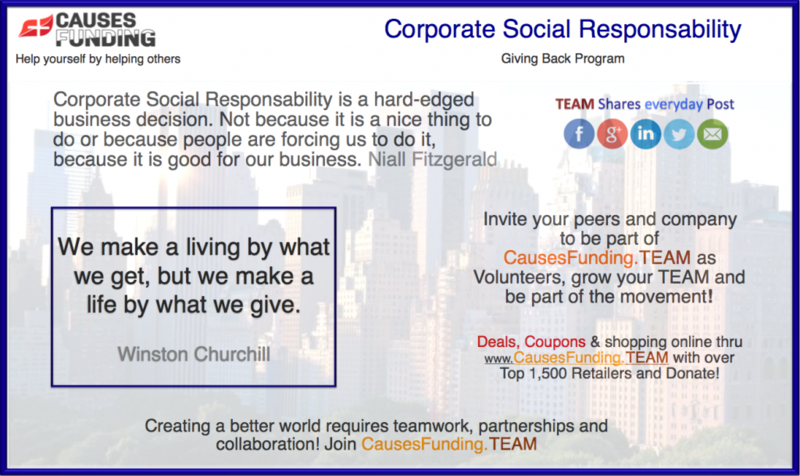 Corporate social responsibility (CSR) refers to aligning Companies with relevant causes and social programs. Such as CausesFunding.TEAM. Your job colleagues are legitimately, smart and always interested in helping Charities and your TEAM grow progress. Employees will donate, become volunteers, create a TEAM and improve their financial situation. 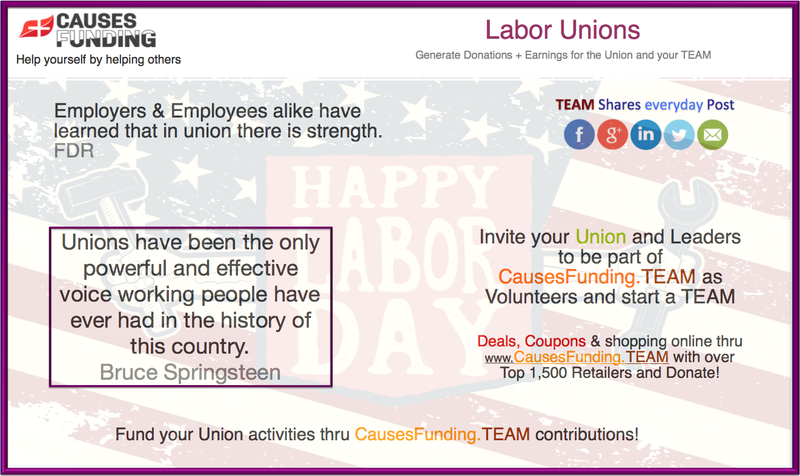 An excellent way to help your Union to generate funds. Unionized individuals can contribute revenue with CausesFunding.TEAM as Volunteers, NO investment or purchase is required. Workers become volunteers, create a TEAM and improve their financial situation. Double Contributions to Unions when they create a TEAM. 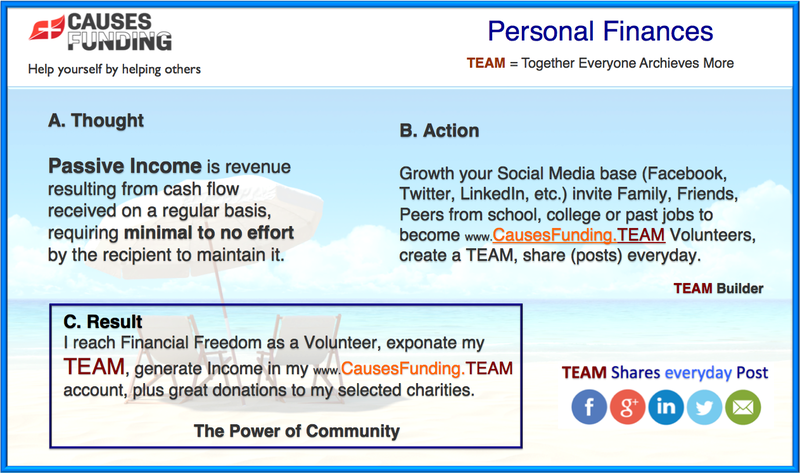 Everyone can become a Volunteer - Donate & generate a passive income! 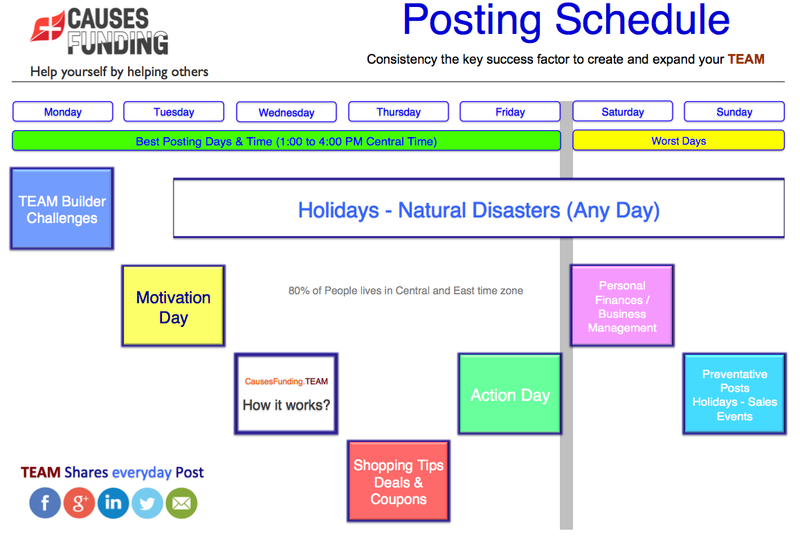 Posts – Daily communications to spread the word! Constant contact with our potential or current Volunteers generates awareness and donations thru online every day sharing. 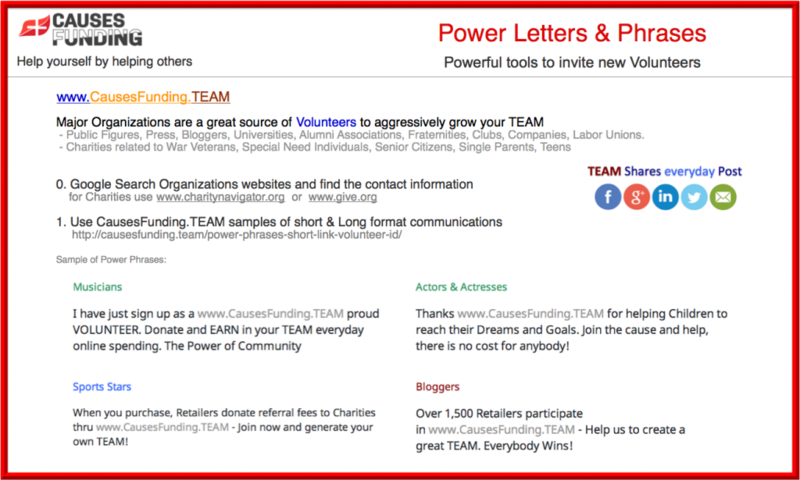 CausesFunding.TEAM volunteer success comes from the true power, to get things done, does not come from a title or position. Rather it comes from the value to convince and produce a great TEAM. 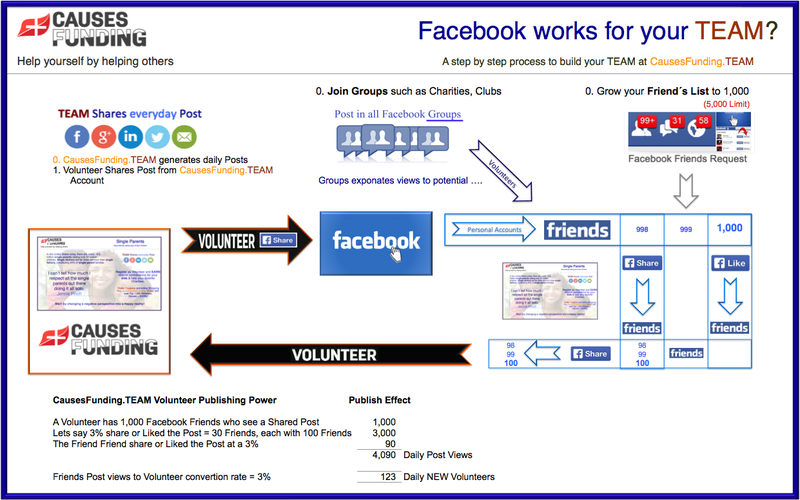 Detail indications to develop Social Media communications like “Posts – Sharing” and TEAM grow. 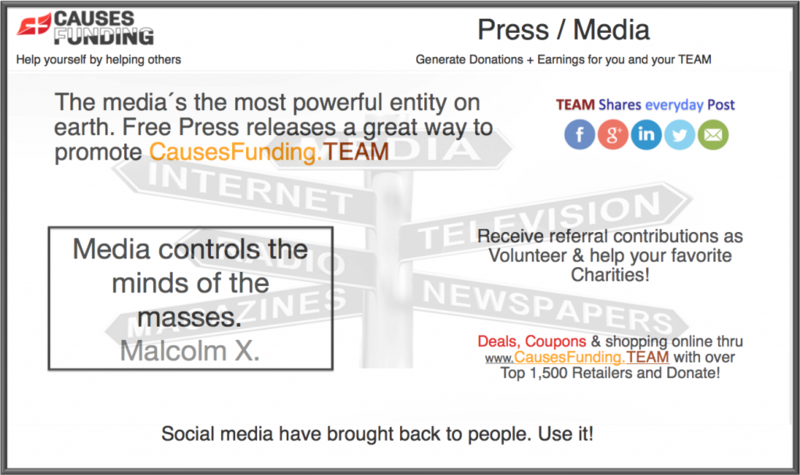 CausesFunding.TEAM generates daily interest with volunteer thru different Post Types such as Motivational, Shopping Tips & Deals, How it works?, Holidays (high online purchases), Natural Disasters, Personal FInances / Business Management. War Veterans & Active members – Our national pride! 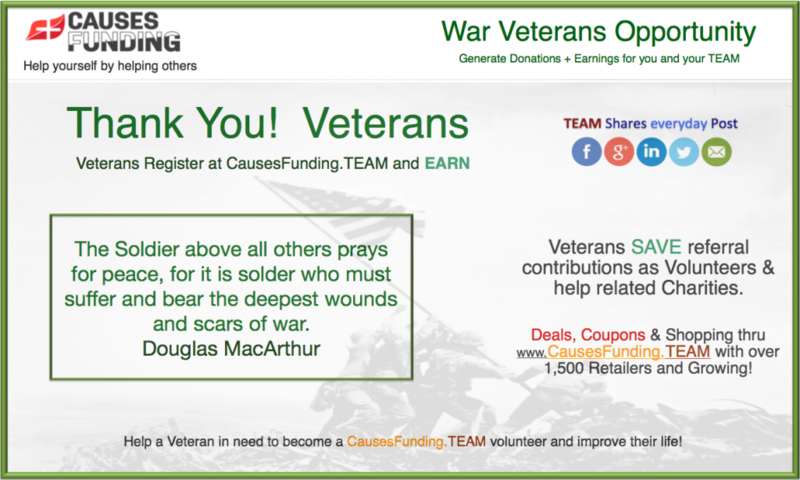 CausesFunding.TEAM is a great way to support Veterans & Active members financially while we help related Charities. Veterans as Volunteers can develop a TEAM and reach higher goals (Challenges). Contact Veterans Charities to propose the program! Particular educational requirements resulting from learning problems, physical disability, or emotional and behavioral difficulties! 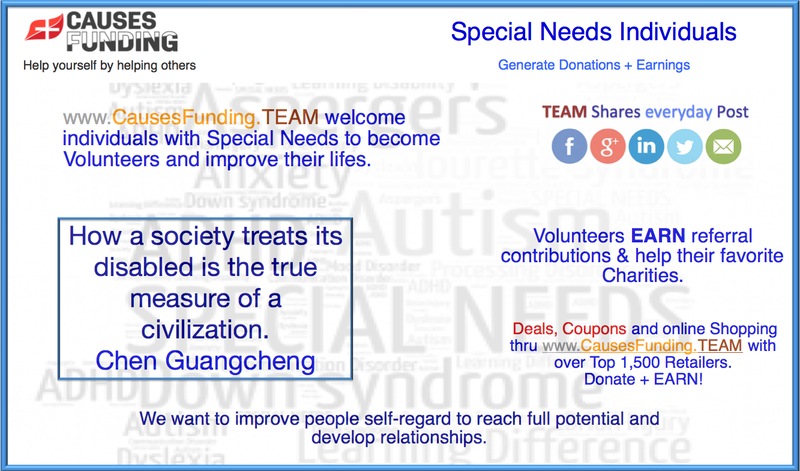 We welcome any person with special needs and encourage Volunteers to invite them and experience CausesFunding.TEAM as an opportunity to grow financially and personally for both parties. Senior Citizens – A great activity for retirement! 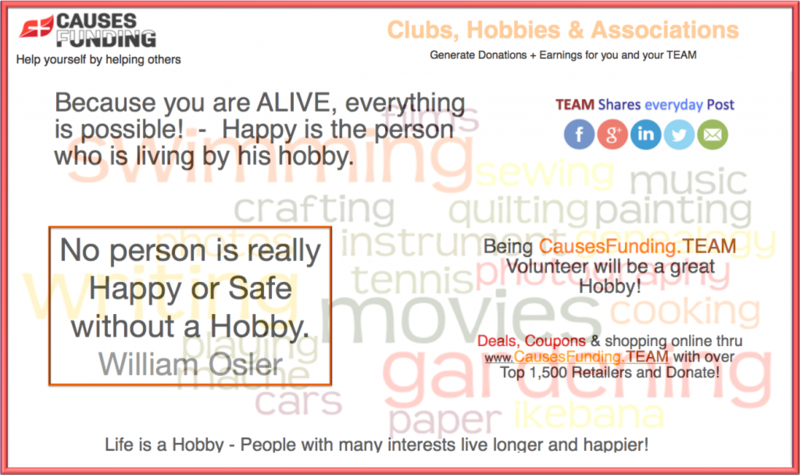 Generate additional income for retirement funds and a fun activity that will help Charities and retiree peers. As a TEAM leader, the Volunteer can coach peers to become Volunteers and spread the word! 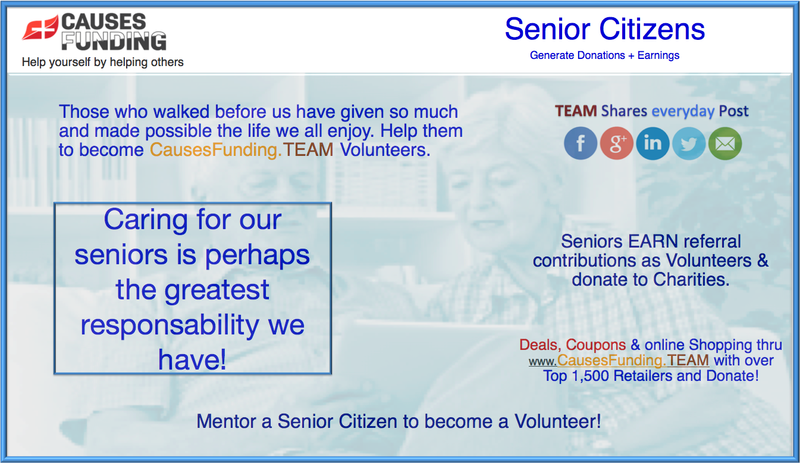 Seniors can help Seniors thru Charities! Do you feel your life is out of control? 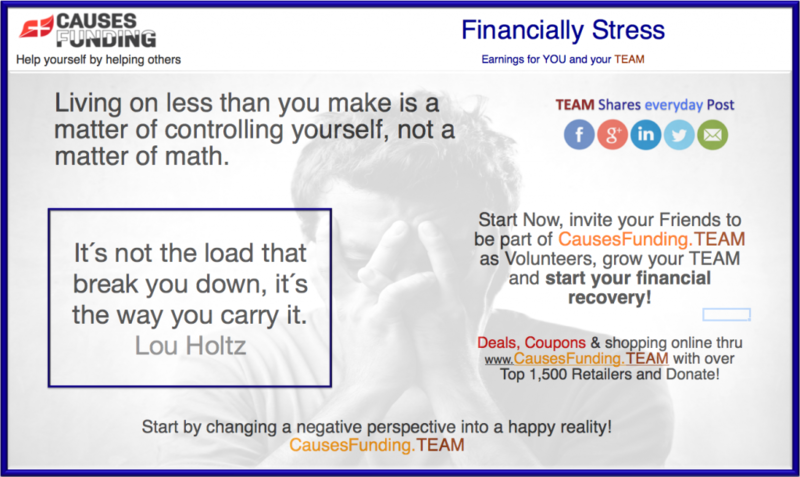 Start by changing a negative perspective into a Happy Reality = CausesFunding.TEAM no investment is required is totally free. Just what you need! Create and manage your TEAM to generate extra money. Help yourself while helping others. Mostly a mother who has a dependent child or children and who is widowed, divorced, or unmarried. As a single mother, she has sacrificed her social and financial independence. 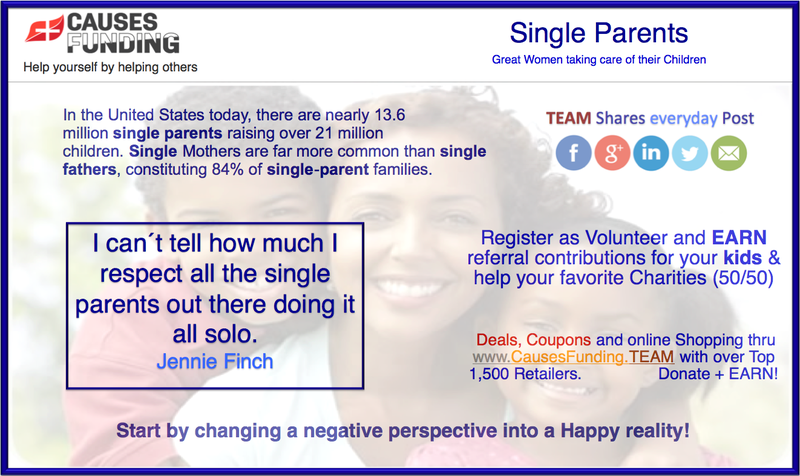 Encourage single parents to register as Volunteers to experience CausesFunding.TEAM as an opportunity to grow financially and personally for the family well being. Teens – A lifelong Summer Job! Adolescents can experience the generation of their first earnings using a great asset, their Social Media Friends. 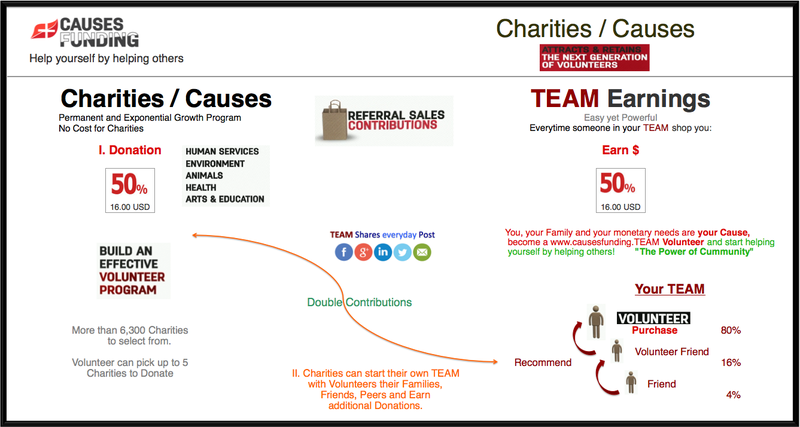 Teens can influence parents shopping thru CausesFunding.TEAM an earn referral commissions! CausesFunding.TEAM is a great program for Charities that help Teens with major challenges to gain self-confidence, motivation and a sense of accomplishment. 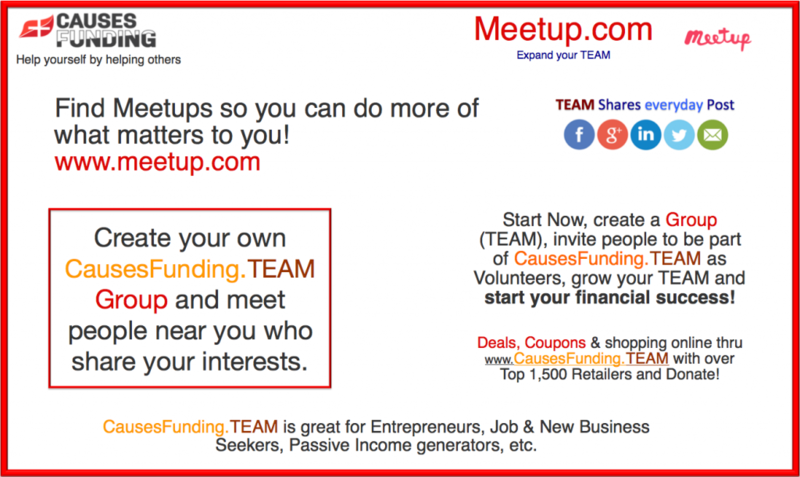 Start a Meetup “CausesFunding.TEAM” group in your town. Invite Meetup.com members to become CausesFunding.TEAM volunteers.